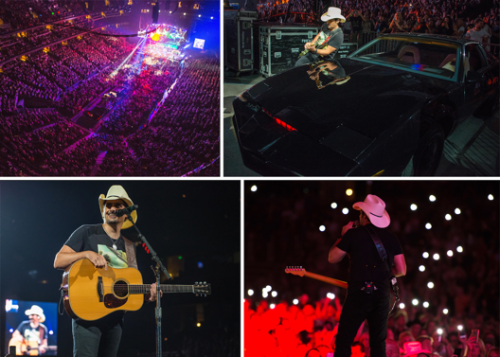 This past weekend Brad Paisley’s 2017 Weekend Warrior World Tour played out west with shows in San Diego, Anaheim and Phoenix – playing to over 40,000 fans and a sold-out show at the Honda Center in Anaheim. Also on hand in Anaheim was KITT, the car made famous by the popular 1980’s television series Knightrider. KITT and the show’s star, David Hasselhoff, have made appearances recently in Brad’s “Last Time For Everything” music video and also his upcoming comedy special, Brad Paisley’s Comedy Rodeo, debuting on Netflix, August 15. The 2017 Weekend Warrior World Tour will continue this weekend in Portland, OR and Seattle, WA. View additional dates at www.bradpaisley.com. Special guests on the tour include chart-topping country star Dustin Lynch, hit-maker Chase Bryant and rising star Lindsay Ell.